If wedding ceremonies in the sky were still rare a few years ago, more and more young couples dream to unite in lush greenery or on a hot sand beach … But before leaving the Marie or the church to get married under a flowery arch, better to anticipate the maximum to prevent the dream turns into a nightmare! 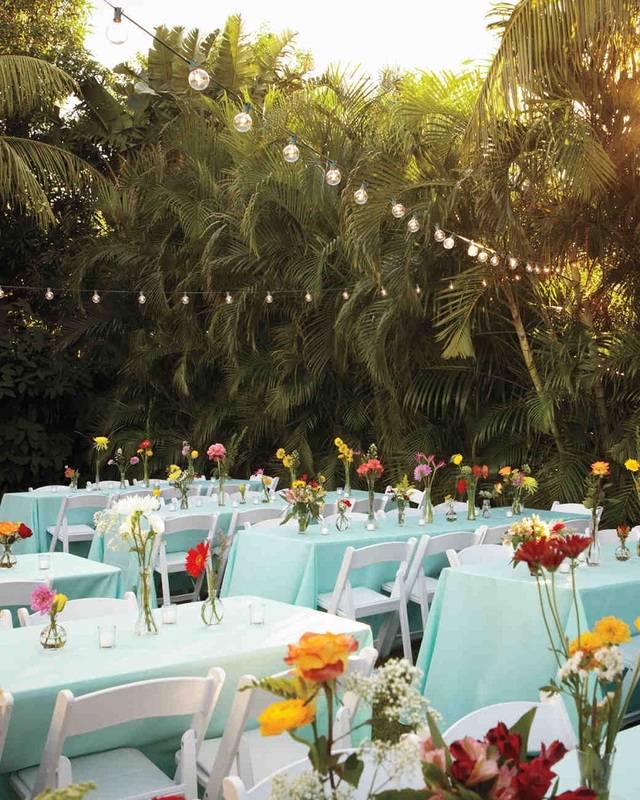 Our 8 tips for organizing an outdoor wedding ceremony. Unless you have booked the arena of Nîmes (and the sound that goes with it), an outdoor ceremony lends itself better to the confidential atmosphere, with a few dozen guests handpicked. If you had planned to invite the ban and back ban, it is better to reserve the largest room of the town hall, the cathedral, the synagogue or any hall with enough benches to sit all that beautiful world! Once your choice is made, the mistake would be to fantasize about your postcard decor imagining a blue sky and a divine time. Because even when you get married in the South in the middle of the summer, the weather can make yours and you impose a storm to decorate the oxen, heavy rain or a blazing sun … Caution is, therefore, to provide a ceremony to the interior in its smallest details, so as not to be caught off guard if it starts to fall from the hail on August 5! That’s it! You have found the place of your dreams! Now we will have to ask the question of the orientation of the chairs and the arch, asking his opinion to the photographer. The idea is to prevent the bride and the groom from having the sun in the eye or to be backlit, which could spoil your memories … As far as possible, try to make tracking the week before. As the outdoor wedding is not yet in our morals, it is better to pamper your guests so that they keep an unforgettable memory. Provide comfortable benches and chairs, taking care that they do not sink into the ground or that do not fall back … Again, preliminary tests are recommended. In case of extreme heat, offer your guests cool drinks, fans and shadows to cool off (or even sunscreen to prevent sunburn!). If the weather is cool, think about the plaids, and do not forget the big umbrellas if the clouds are threatening! 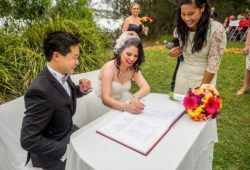 An essential part of the outdoor wedding ceremony, the ark will set the tone for your ceremony. Depending on your budget and level of DIY, you can either rent it or make it yourself. For a bohemian and bucolic wedding, opt for a wooden arch or pergola covered with branches, white flowers and possibly linen. For a more spectacular effect, rent a podium, a large pergola covered with a white canopy, and do not forget the white carpet between the aisles of chairs! Side deco, the simplicity is of setting for a ceremony in the open air. The real decor is the natural setting all around! As in the church or the town hall, you can emphasize the central aisle with seasonal flowers hanging on the chairs or a carpet of petals, otherwise, favor the white and do not forget that the elegance also rhymes with sobriety. If the arch is in front of a large tree, you can also hang some white Japanese paper balls or a light garland on the branches. In any case, avoid accessories that might fly away or get damaged in case of rain, and do not forget the sound if you want to make your entry into music!